Are you a classic cars fan? Then, you would most likely face the problem of finding suitable replacements for the car parts as most of the older models are not produced anymore. One of the problems that diminishes printing old car parts is the lack of market demand. The traditional production process requires a high demand in order to cover the production costs. This problem does not exist with 3D printing technology which is initially presented as rapid prototyping technology. 3D printing enables designers to produce products and parts on a smaller scale as they have the ability to print the model one by one based on the computer STL model. Can we use this advantage in producing car parts that are not available in the market anymore? The direct answer is yes, we can. If you have a 3D model for the car part you would like to create with the suitable 3D printer, then you can print it and attach it directly to your car. Erik Harrell provided a unique experience to produce a full 3D printed car engine that functions efficiently and similar to the original motor. 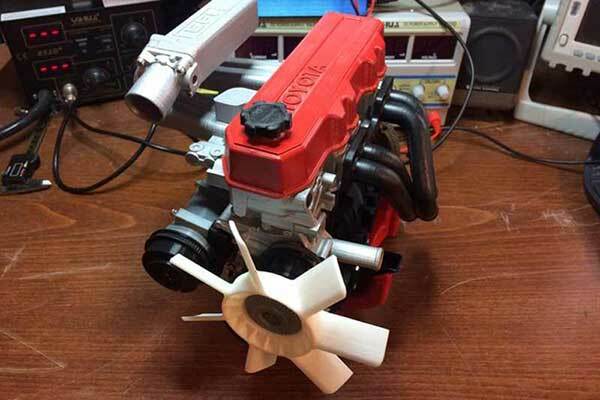 The initiation that has been presented on Thingiverse is based on creating a small version of the old Toyota engine 22RE. Toyota produced this model between 1985-1995 and has not been produced since then. The engine is 4-cylinder with 105 HP and 137lb-ft torque. The engine that was fuel injected was widely used in different types of cars. 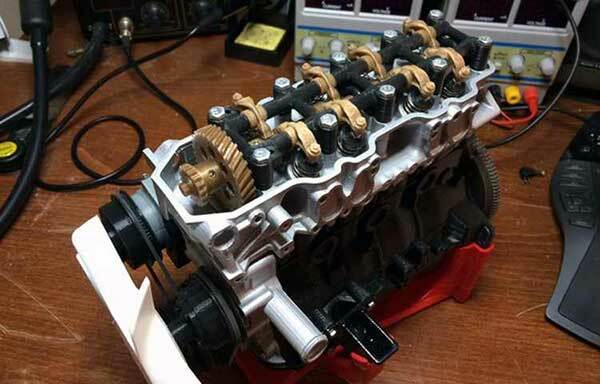 The idea of 3D printing a car engine is not as easy as it sounds. If you observe the engine parts, you would know it is very complicated and requires accurate measurements in order to handle the assembly of all the parts properly. The figure below shows the assembled 3D printed engine. Erick Harrell uploaded all the STL files required to 3D print the model. Considering that most of the desktop 3D printers has a small bed size, he reduced the size/ratio of the parts down to 35% in order to make it easy to print using most 3D printers. If you have a larger 3D printer, you can easily rescale the STL models to its original size. The parts are printed by the Fused Deposition Modeling technique using the plastic filament. In addition to these parts other parts are used such as the metal springs, fasteners and bearings. The total number of the 3D printed components are 80 parts and it requires more than 50 hours to print all the parts. Can we really 3D print car parts? In order to maintain the measurement accuracy, the 3D printer uses 0.2mm layer height filament which ensures high quality printed parts. An accurate calibration for the 3D printer is required to ensure the quality output as well. This project provides another example to the implementations in the 3D printing industry and how to use the emerging technology in order to create industrial parts that are not available in the market anymore. Although cars cannot depend on the actual 3D printed engine for omissions, the technology can be implemented in creating the broken or the missing parts. The broken part can be 3D scanned to build the STL model on any 3D printing software. Then, the STL files of the broken or missing part can be 3D printed. Many of the parts can be printed such as the plastic parts which are not directly in contact with the high engine temperature. The plastic filaments can melt on the temperature of 200 degrees Celsius, which make it hard to use in the space around the engine. So, it can be used in the interior parts. This project can be a base for further investigations over the same course of implementations to create parts that be used with the engine at very high temperature such as cylinders and inner engine parts.